This weekend has been a rainy and chilly one in New Jersey so we have been spending it inside. We decided that a perfect thing to do would be having a movie night! 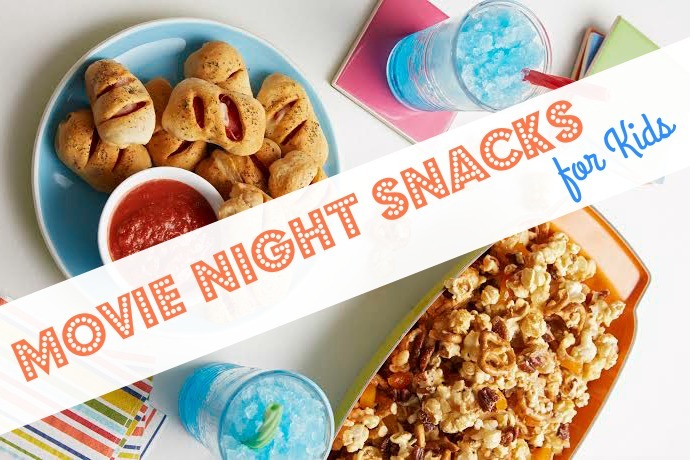 I don't know about you, but when we think of movie nights we think of tasty snacks! To go along with some of our favorite movies we are making these simple and kid friendly treats! Thank you FamilyFun Magazine for sharing these fun recipes with us! Sweet! Salty! Crunchy! This pumped-up popcorn is a winner. 3. In a saucepan, combine brown sugar, butter, corn syrup, and salt (an adult’s job). Cook over medium heat until it boils. Boil for 2 minutes. Remove from heat; stir in vanilla and baking soda. Little movie critics will slurp this super slushie right up. This pizza-parlor staple goes mini—turning it into the perfect food for your viewing party. 2. Help your kids roll out each biscuit to ⅛-inch thick. Place 3 slices pepperoni and 1 cube cheese on each round. Pull the edges up around the filling, and pinch dough together at the top. Place in the pan, with the seam side down. 3. Repeat with all the dough rounds, slice two vents in the top of each, and brush with olive oil. Sprinkle with dried herbs and garlic powder. 4. Bake 30 to 35 minutes, until golden brown and cooked through. Serve with pizza sauce. Visit FamilyFun Magazine's website here!